Felipe Belalcazar is a devoted heavy metal fan. 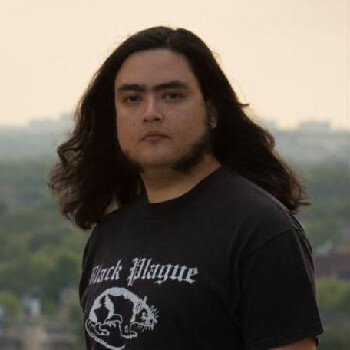 When he landed an internship at a production company working on a documentary film about extreme metal – a subgenre of heavy metal music – the Wilfrid Laurier University Journalism graduate was beyond excited. The internship began a year after Belalcazar completed his studies at Laurier’s Brantford campus in 2011. It gave him the opportunity to brush shoulders with some of heavy metal’s most influential musicians, including members of the band DEATH. Belalcazar grew more excited as episodes in the documentary series came together. Soon after, he left the company to chase his own dream of becoming an independent filmmaker. The idea of creating a documentary about the band DEATH kept coming back to Belalcazar. Unable to shake the idea, he called an industry connection he met during his internship and successfully pitched the idea. So began Belalcazar’s two-year journey to research, film and edit Death by Metal, his first feature-length documentary, but it was at Laurier where Belalcazar acquired the skills needed for his incredible adventure into documentary filmmaking. Death by Metal tells the story of DEATH frontman Chuck Schuldiner, who passed away in 2001 after a battle with cancer, and his impact on heavy metal music. Belalcazar compiled rare behind-the-scenes footage and completed dozens of exclusive interviews with Schuldiner’s bandmates, family and friends. The film’s debut screening took place at a heavy metal festival hosted by Decibel Magazine in Philadelphia in April 2016. After its premiere, the film was shown in Europe, where it was featured at several film festivals, before returning to the United States and Canada. Death by Metal received rave reviews from fans and rose to the top of the documentary bestsellers list on Amazon when the DVD was released during the summer of 2018. Belalcazar and his film were also featured in several music magazines. Journalism wasn’t Belalcazar’s major when he began studies at Laurier. During his second year, after enjoying several classes taught by Associate Professor of Digital Media and Journalism David Haskell, it was suggested Belalcazar consider transferring into the program. Initially, Belalcazar was hesitant. He didn’t want to work for a newspaper, be on television, or work as a journalist in the traditional sense. But, soon, he began to see options when it came to where journalism might take him. After transferring into the Journalism program, now called Digital Media and Journalism, Associate Professor of Digital Media and Journalism Sue Ferguson introduced Belalcazar to the idea of focusing his writing on music. “Up until that point, because I played music and went to gigs all the time, I was writing for a couple of music websites,” he said. Belalcazar brought examples of his stories for Ferguson to review. After learning about journalistic practices, he began taking a more professional approach to music writing. “I started applying everything that I was being taught as a journalist and bringing it into music,” he said. Belalcazar continued his studies in filmmaking after graduating from Laurier, but he credits his time at the university’s Brantford campus for helping him most in the process of making a documentary. He said the skills he acquired at Laurier, from interviewing to research and storytelling, were most beneficial. “Journalism at Laurier taught me to think critically about stories,” he said. “You need to be very well prepared and very well read. For his next project, Belalcazar is working on a documentary film with the Canadian Warplane Heritage Museum in Hamilton. Voices from the Past will feature interviews with Canadian service members about their experiences during the Second World War. Belalcazar is also working on a project about the restoration of a TBM Avenger aircraft from the Royal Canadian Navy.